Lovely unique baked beads on toast earrings with fimo roses and silver plated Tibetan design. 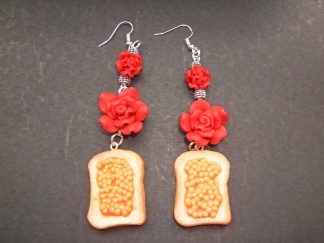 The imitation mini toasts and baked beads are made from clay and with 15mm small red roses and 24mm larger roses. Silver plated fish hook design. Sterling silver also available.